This image of the Pacific Ocean was produced using sea-surface height measurements taken by the U.S.-French TOPEX/Poseidon satellite. The image shows sea surface height relative to normal ocean conditions on September 12, 1998; these sea surface heights are an indicator of the changing amount of heat stored in the ocean. 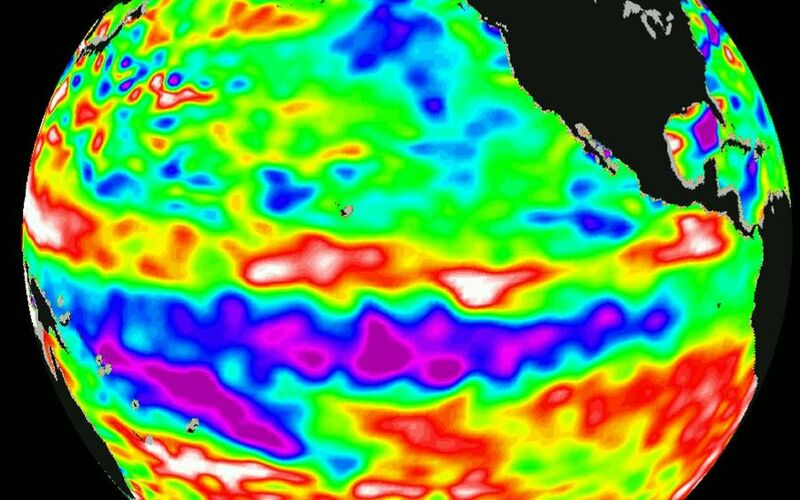 The tropical Pacific Ocean continues to exhibit the complicated characteristics of both a lingering El Niño, and a possibly waning La Niña situation. This image shows that the rapid cooling of the central tropical Pacific has slowed and this area of low sea level (shown in purple) has decreased slightly since last month. 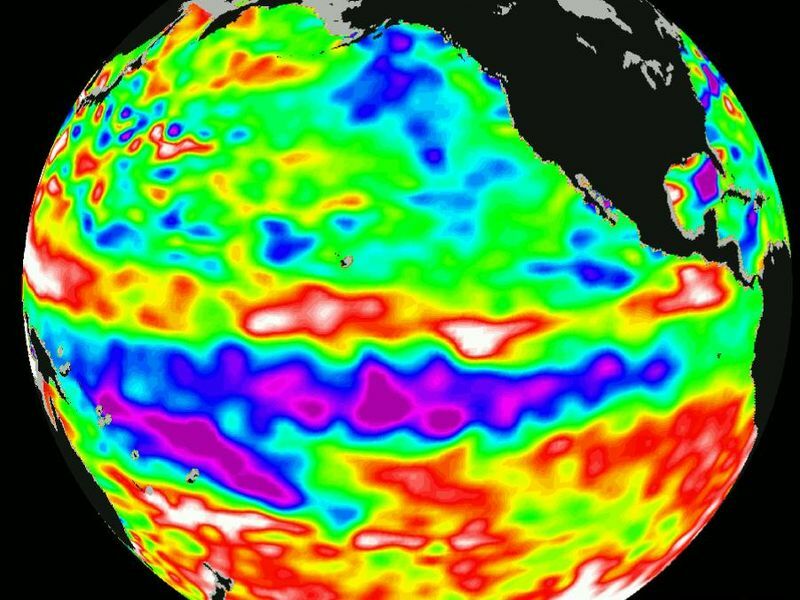 It is still uncertain, scientists say, that this cold pool will evolve into a long-lasting La Niña situation. 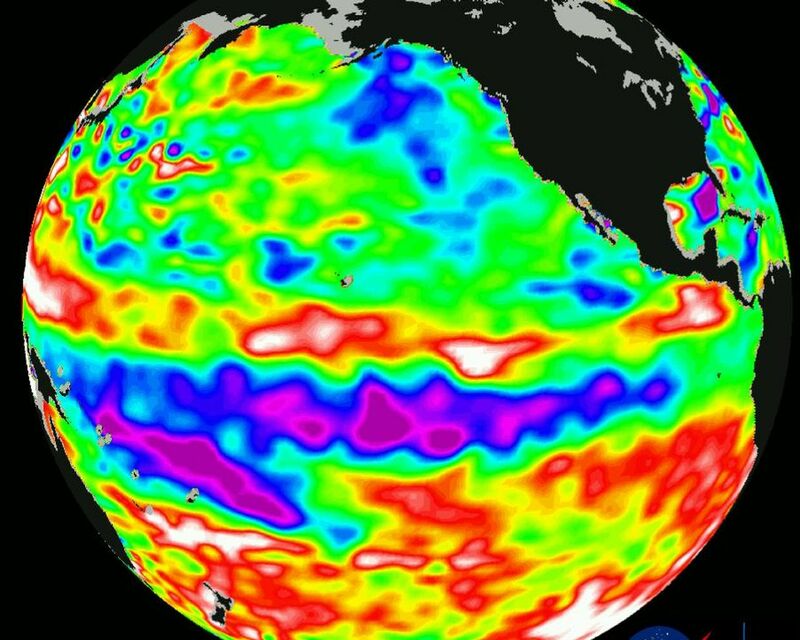 Remnants of the El Niño warm water pool, shown here in red and white, are still lingering to the north and south of the equator. The coexistence of these two contrasting conditions indicates that the ocean and the climate system remain in transition. These strong patterns have remained in the climate system for many months and will continue to influence weather conditions around the world in the coming fall and winter. 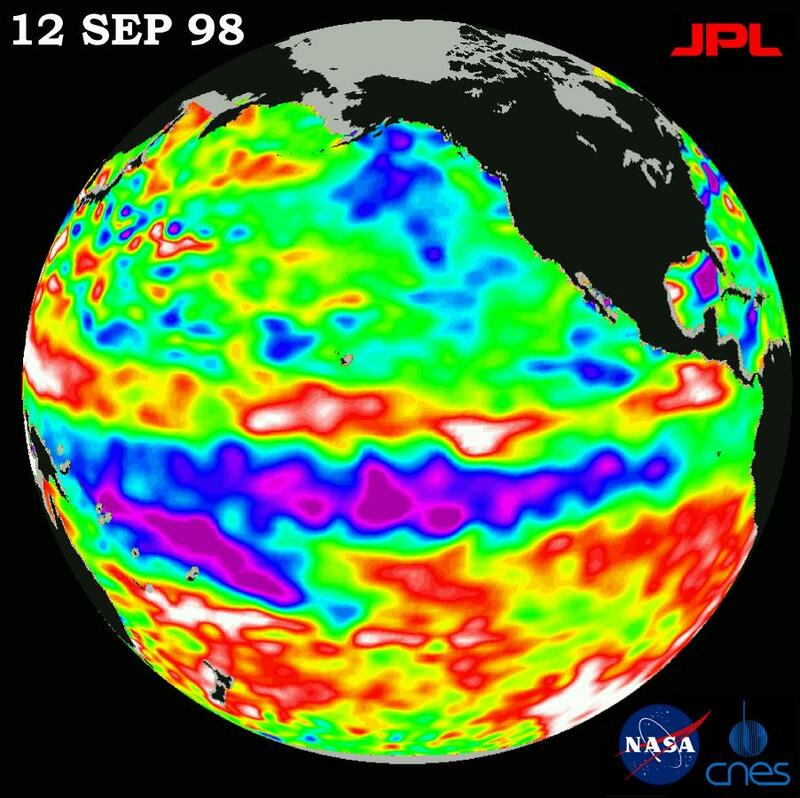 The satellite's sea-surface height measurements have provided scientists with a detailed view of the 1997-98 El Niño because the TOPEX/Poseidon satellite measures the changing sea-surface height with unprecedented precision. The purple areas are about 18 centimeters (7 inches) below normal, creating a deficit in the heat supply to the surface waters. The white areas show the sea surface is between 14 and 32 centimeters (6 to 13 inches) above normal; in the red areas, it's about 10 centimeters (4 inches) above normal. The green areas indicate normal conditions. The purple areas are 14 to 18 centimeters (6 to 7 inches) below normal and the blue areas are 5 to 13 centimeters (2 to 5 inches) below normal. The El Niño phenomenon is thought to be triggered when the steady westward blowing trade winds weaken and even reverse direction. This change in the winds allows a large mass of warm water (the red and white area) that is normally located near Australia to move eastward along the equator until it reaches the coast of South America. The displacement of so much warm water affects evaporation, where rain clouds form and, consequently, alters the typical atmospheric jet stream patterns around the world. A La Niña situation is essentially the opposite of an El Niño condition, but during La Niña the trade winds are stronger than normal and the cold water that normally exists along the coast of South America extends to the central equatorial Pacific. A La Niña situation also changes global weather patterns, and is associated with less moisture in the air resulting in less rain along the west coasts of North and South America.